Grace swam this past weekend and had a few good swims and a few not so great swims. As this was the championship meet for short course she (we) were hoping for better results. She had what is best described as “technical issues”. In other word, sloppy walls. She was disappointed but these disappointments don’t deter her. She will never end up on a therapists couch saying “my parents made me swim”. She gets 100% effort from us! She never misses a practice – we never skip a meet. She has been given all the tools to success. And then some. If she asked to quit we would let her. She loves to swim. Quitting for her is just not an option, it isn’t even a thought. She’s not a fire in the belly fighter. It’s just not who she is. But when she is in a do or die situation she can find the drive to do. This past weekend in 50 free she came in 16th. I took a quick glance at meet mobile, it wasn’t a best time for her and I knew that making finals would be close for her and so seeing her in 16th made me happy. Like I said quick glance. I wasn’t sure if results were being posted on deck so I sent her a text to let her know she made finals. She quickly replied that she had tied and there was a swim off. I have seen a lot of swim offs in my day but never four kids swimming for the last spot in finals. I literally felt my heart sink. My friend said “can Grace do it?” Without a second thought I said yes. I was sitting with a lot of her former teammates parents and we were positioned right above her lane. She had a nice little cheering section (side note, it’s awesome that friends are friends regardless of who they swim for). I’m not sure Grace heard us before the race but she surely did after. Because they only had the times on the board she wasn’t sure how she fared, no names or places and it was a close race. But the smile on her face confirmed that she heard us after the race. 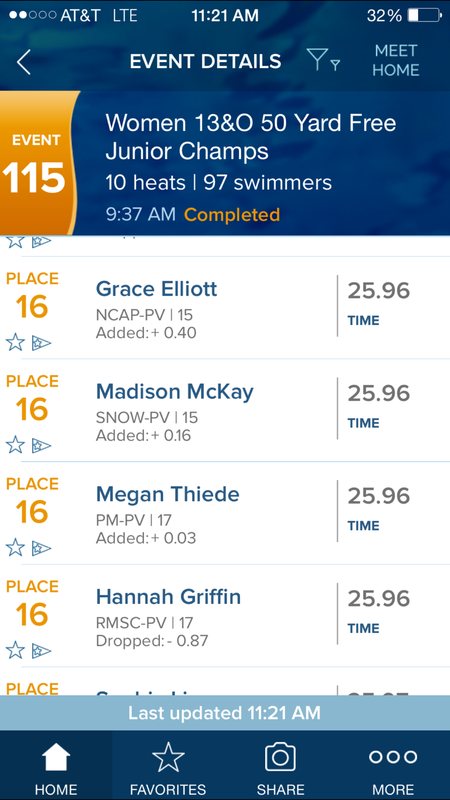 Without getting a best time in either race she had earned the right to back and swim finals. Third time does happen to be a charm. In finals she dropped time. In the end the meet had highs and lows. As usual I find myself worrying about my child because, well, that’s what parents do.. I urge you to read the entire article. It’s so meaningful. I always think of my middle daughter as the gritty, scrappy fighter. But Grace has grit. Along with a lot of heart and soul. She won’t give up. Once again I’m reminded to breathe. The younger two start Junior Olympics this weekend. Good luck to all this championship season. Remember to breathe. These swimmers, the have grit!!! ← On the outside looking in…. I love swim offs. Because it is almost guaranteed that one swimmer will go faster. Usually I see both go faster than the prelim time. How many of the 4 went faster? It is just something about the do or die situation that makes the kids go faster. I wish every swimmer could swim every race like it was a swim off. They would all go faster. I once heard about a swim off that went 3 rounds because of ties in the swim offs. My daughter did say once that if she was ever in a swim off in the 400IM she would gladly give up the spot in finals.